#25. 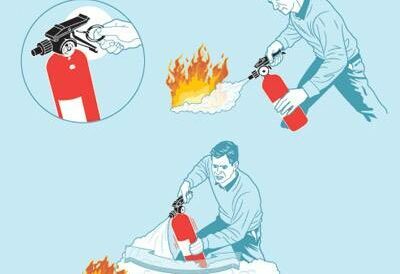 Using a fire Extinguisher: an extinguisher has as little as 8 seconds of life. So remember the acronym “PASS”: 1) Pull the pin. 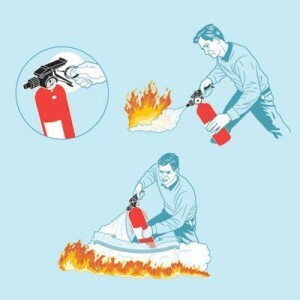 2) Aim the nozzle at the base of the flames. 3) Squeeze the trigger. 4) Sweep the spray from side to side. And don’t assume the fire is out just because the flames are gone. Call 911 and wait for the fire department to give you the high sign. #30. Stem a Flood—and Save Your Wiring: the water shutoff will be near the water entrance to the house. Look for a metal wheel or a flat handle like a paddle. Or check outside for a mini manhole cover—the shutoff may be there. Find the main electrical switch- On an old fuse system, it may be a big lever or a handle that pulls out a whole block. On a modern breaker box it will be an isolated switch near the top of the box. Flip it to keep the circuits (and you, too) from getting fried.